I'm playing with strings, sewing them down to phone book pages. This is going to be Rocky Road to Kansas, inspired by Eleanor Burns, Egg Money Quilts. 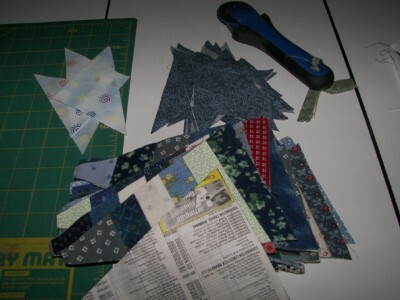 This particular pattern has 2 cardstock templates which are provided in her book. Thanks Eleanor! I've made it before and it turned out great. First, I rough cut the phone book pages to wedge size, then sewed on all the strings. There is no measuring, so this part goes FAST. I already had strings, and used most of my 1 1/2 in. pieces, but added wider and narrower for interest, mostly in the blue range. I drew around the wedge template on the back of the string units, then trimmed with rotary cutter. 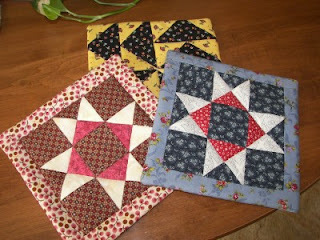 The center pieces start as squares, cut in half, sewed on the widest part of the wedge, and trimmed. They are consistent for the entire project. This will be 30, 12 inch blocks, 5 x 6, and I'll probably add a border. I sewed the 4 wedges together, with that triangle attached and ended up with a star thingy, points flapping in the breeze. (I forgot to photo the white template piece used for the 4 sides, provided as well.) I marked with pencil the center of that white triangle/pivot point and pinned it to the inside pivot point of the star, started sewing at the outside star point to that pivot point, needle down, and wrangled it around (used a stiletto) and sewed down the other side to the next point. One would not think it would work but it DID! I bit of pressing and voila! After the first one, I discovered I should remove the paper from that pivot point for a sharper pivot. First one is OK. 8-)) NO puckers! Below are several 6 inch orphan blocks made into potholders. I used one layer of cotton batting, then one layer of Insulbrite. I found that turning them was not neat and tidy for my first ones (had forgotten how to do this simple task - note the flying geese points all caught in the thick seams!). Then I remembered how to do it better! 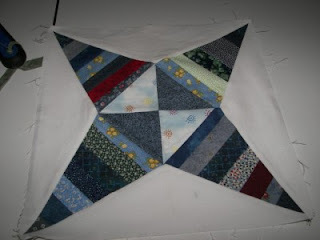 Add a small sashing so the points wouldn't get lost, and for the backing. put a seam in the middle of the backing, but leave a few inches for turning. For me, it's impossible to turn that item neatly leaving a side seam open, but if you sew a seam in the backing, and leave a few inches for turning, sew all 4 sides, it turns so much neater, then simply hand stitch the backing seam closed. I machine quilted a few seams to finish it off. I don't hang my potholders, so no tab. AND no fussy binding. love that mini tutorial on the pot holders. makes so much more sense to do it your way. I want to make some for some sewing friends for Christmas and this is perfect! I like your pot holder method, too. Thanks for the info! BTW, have you tried just not accepting Anonymous comments without word verification? Sure made a difference for me. I like your potholder method. Ivebthoughtnof makingmpotholdersmbut it seemed so much trouble I never bothered. This would be easier.m thanks. I've done many y seams lately and found it works better to stop and back stitch at the point. Needle out and start again. Slower but perfect results every time.,,just a thought. Thanks for the posting on the Rocky Road to Kansas block. I have lots of string blocks that are 4.5x10". I just use them for mindless sewing. Now that they are stacking up it is time to seriously consider using them in something. What a fun and informative post!! Thanks for sharing! Thanks for the tutorial. Your tip about leaving an opening in the middle of the back for turning has probably simplified a whole lot of projects I have been putting off. Thanks! Good call on adding a little border to your blocks! Darling pot holders! And your Rocky Road will be dynamite! I must make that quilt one day! Your Jamestown quilt is wonderful! Your potholders look great! And I agree with Janet; I went to zero Anonymous comments and then had no more trouble with spam, even though I don't use the Word Verification. Perhaps I've made the best settings - I don't see the dreaded Word Verification! Now, I'll be watching that no spam gets through! Thanks for the potholder tips. It appears your new quilt project is moving right along. It looks great. Love your idea for simplifying the potholders! Sure beats putting on binding too. Now maybe I can get some new ones done!